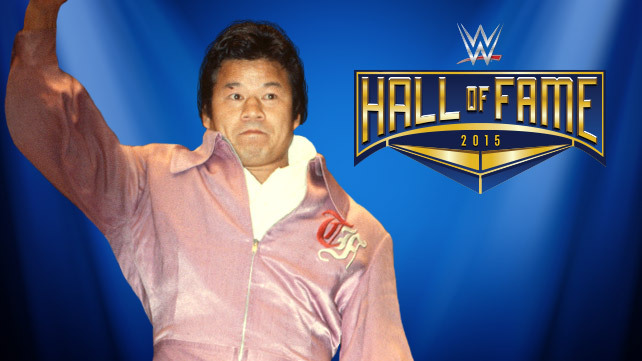 WWE.com has announced that Japanese Legend Tatsumi Fujinami will be joining the WWE Hall of Fame Class of 2015. Fujinami marks the 8th inductee (or 7th plus an award) for the Class of 2015, making it one of the largest in years. Fujinami is going to be a name which many US wrestling fans are unfamiliar with. He predominately performed in Japan, as one of their top stars from the 1970s through the early 2000s. A 6 time IWGP Heavyweight Champion, Fujinami is considered to be one of the “Founding Fathers” of New Japan Professional Wrestling along with WWE Hall of Famer Antonio Inoki. WWE did a good job explaining Fujinami’s importance in their Hall of Fame video. Take a look below. I have some research to do and will release a full induction article on Fujinami soon! This entry was posted in Class of 2015, WWE Hall of Fame NEWS and tagged Fujinami, Japan, New Japan Professional Wrestling, tatsumi fujinami, WWE Hall of Fame. Bookmark the permalink.